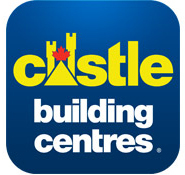 Docks & Decks Unlimited Inc. Lights are perfect for use on wooden projects like decks and docks-either as part of new construction or retrofit into existing structures. The wide lip with beveled edges supports the light and its smooth rounded corners make the Deck & Dock Light a safe, yet elegant addition to your outdoor living area. Since Paver Lights are installed flush with grade, there’s nothing sticking up out of the ground for you to trip over, hit with your lawnmower, or have your kids knock over while playing in the yard. Our Deck & Dock Lights integrate seamlessly into wooden structures and Wall Lights don’t protrude beyond the face of the wall. The 12 volt system is safe and economical to operate and does not require a licensed electrician for installation. The bulbs, while easy for adults to change, are not accessible to children. The warm color appearance of the incandescent lamp included with each fixture is appealing since it’s similar to candlelight or the illumination of a kerosene lamp. 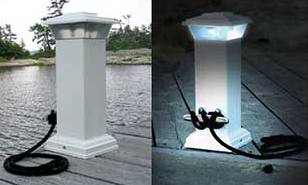 These solar lights are mounted on top of a sturdy steel base, housed inside an attractive, Colonial style 12″ tall, 4″ wide vinyl pillar. Easy to install and NO WIRES. These decorative and functional dock accessories will add style to your dock day or night. The lamp is designed to illuminate your boat, dock and stainless steel cleat, and not shine in your eyes. 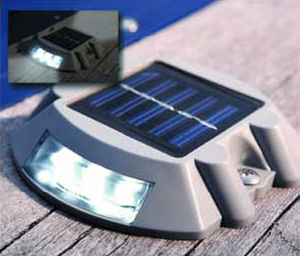 Each kit includes, pillar, stainless steel cleat, mounting base, solar light and rechargeable batteries. Is easy to install. 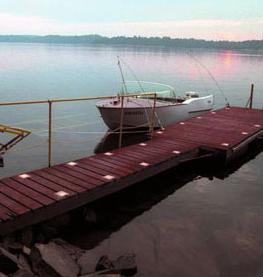 Its’ durable, weatherproof low profile construction makes it an attractive and functional addition to Docks, Walkways, Decks and Landings. Ideal for illuminating trouble spots on pathways or transition areas such as from dock to shore. 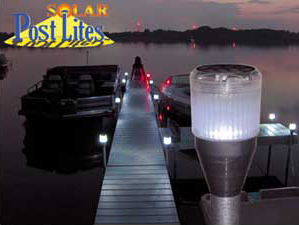 With extended duty solar charged batteries the DockLite™ will last until sunrise. Automatic on-at-dusk. NEW, Brighter Super Bright LED 6 LED colors available. Patent Pending Universal Fitting 2X More powerful than garden lights! Also Fits New 2.00″ (51mm) OD with available adaptor Popular in Michigan / Ontario Areas.